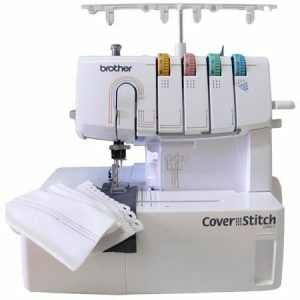 As an affordable cover stitch machine, Brother 2340CV is quite good. The quality of stitches are pretty good. But it is not without limitations. 2340CV is a cover stitch or cover hem machine. This machine allows you to make a wide variety of cover stitches on different types of fabrics with consistent quality. This is a machine designed to do two specific things, chain stitches and 6mm triple needle cover stitches. With this machine, it is easy to attach lace, tape, elastic and do circular hemming as it doesn’t cut as it sews. That is exactly where this machine is different from other sergers. The differential feed is another feature. With differential feed adjustment dial, you can easily adjust the speed at which the fabric is fed through the machine. This machine has most of its parts made of metal, which means Brother has created 2340CV to last long. You can adjust the pressure foot pressure on this machine. It features easy to change snap-on presser feet. It has a bulb lighting, which is never enough. Exterior lighting is the way to go. The machine weighs 15 pounds which is just about enough to qualify as a portable machine. It comes with a good bunch of accessories as well. It has 1/5/25 year serger warranty. Brother 2340CV seems to be a good machine for a specific purpose, for doing cover stitch. This machine costs way less than those industrial cover stitch machines which normally cost above $1000 all the time. I tested this machine for a t-shirt project and the results were pretty good. It had perfect hems. One notable thing is that the cover stitches are as good as (may be even better) the stitches on high-end sergers with cover stitch function. This machine has an incredibly fast motor and it gives high quality, professional results. As a small business owner, I am sure that you will be able to start making good profits quite fast. I have tried it on swimming suits, leotards and athletic clothing and the results seem very good. This machine doesn’t have an automatic tension release. The manual tension release might require a couple of tries before getting used to it. In fact some users got really frustrated with this feature. This is not a serger, some people mistake this machine for a serger. I just wanted to draw your attention to it. Some users, especially beginners might find threading difficult. But I found an excellent video on YouTube which shows the correct way of threading. It will help you for sure. Just search with ‘How to thread the Brother 2340cv Coverstitch Machine’. This is not a true serger and that is the reason why it doesn’t have a cutter. So you need to have a different machine for your serging requirements. When you consider the prices of other industrial cover stitch machines, Brother 2340CV is an affordable cover stitch machine. Yes, it has some limitations which I have explained earlier, but considering the price, it is a good deal.